Malleret Designs (based in Austin, TX) specializes in creating spectacular floral and event designs for galas, weddings, corporate events, and luxury social occasions. Their mission is to create stunning and memorable moments for high-end clientele the world over. The work of Marcela Bogado and her team at Malleret is simply stunning. But the company’s older portfolio website left a lot to be desired. It had been several years since her design had been updated, and it was time to bring Malleret’s online style current with modern tastes. 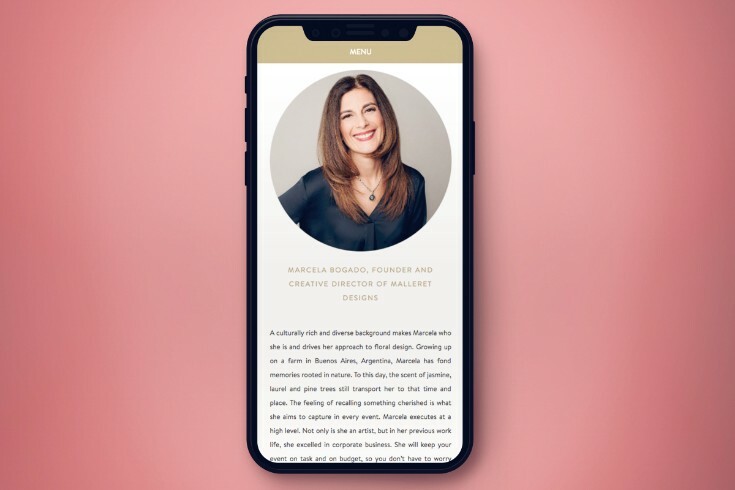 Marcela’s big goals were to create a design that is mobile responsive, includes beautiful scrolling features, and gives customers a better glimpse into the gorgeous design capabilities that Malleret has to offer. 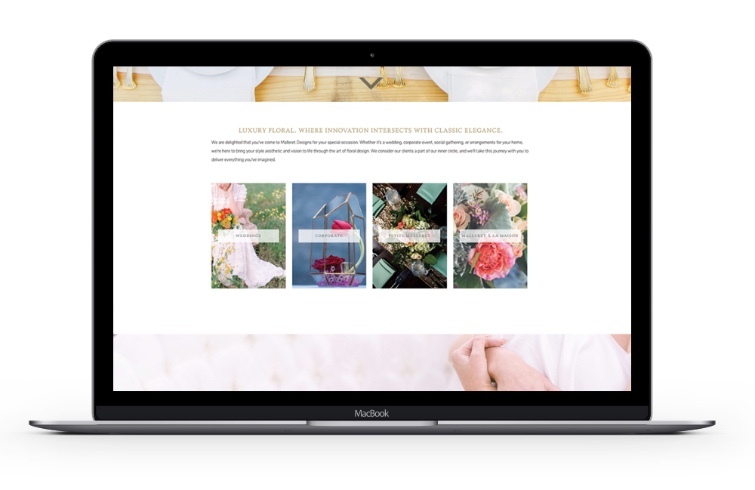 Marcela partnered with PhotoBiz’s in-house website designer, Ashlie A. to create a new design every bit as impactful as her beautiful event designs. Ashlie and Marcela worked together to bring Malleret’s new vision to life. 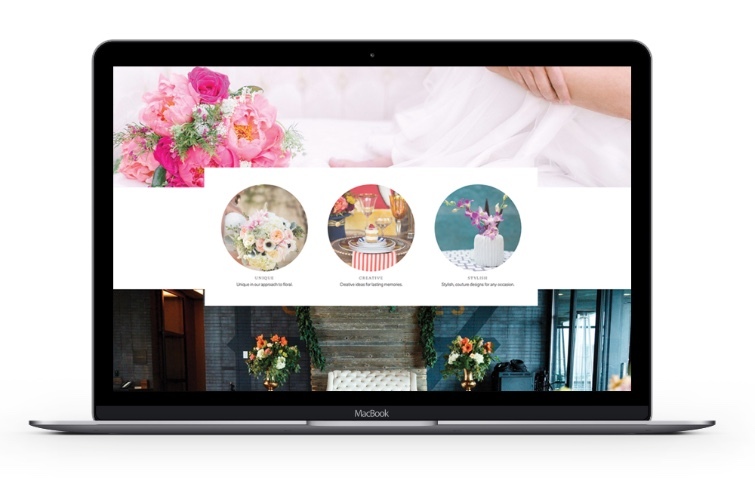 Their work included a complete redesign on PhotoBiz’s updated site builder platform and a brighter, more modern style with plenty of fine details. The result was a sparkling clean look that was a cinch to use. Ashlie included plenty of polished design features that brought the level of Marcela’s new website from good to awesome. For example, the fine transparent text overlay on these image blocks. Or the clever use of whitespace, creating an elegant, floating container between two FX banners. Ashlie also refreshed Marcela’s logo, which was the final piece in creating the company's brand new online look. Ashlie notes that this is one her favorite designs. Malleret is a design focused company, and they knew what they wanted from the beginning. Marcela provided many examples of designs she loved, and Ashlie was able to incorporate her favorite elements into her new website. The Malleret team was also thrilled about their design, which presents their company as the leader they are in their industry. We are so excited share with you the new Malleret Designs website and are honored that they chose the PhotoBiz design team as a partner! If you’re interested in finding out more about PhotoBiz design services, visit us online at photobiz.com.